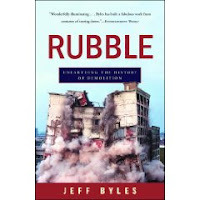 Rubble is a popular history of sorts of the industry of demolition. In many ways it’s a curious book, blending high brow magazine writing with quasi-academic verse, thus mixing newspaper-style reporting, and its emphasis on facts, figures and spectacle, with the high philosophy of Walter Benjamin, Jean Baudrillard, and others. The style of writing kind of works, but it does drift into pretentiousness in more than a few places. Some of the case material is fascinating, for example in relation to the Haussmann clearances of Paris, the razing of Pruitt-Igoe ghetto in St Louis, and urban clearances of Detroit where 161,000 buildings were demolished between 1970 and 2000. However, the book suffers from a number of problems that made it quite difficult to persevere with (though I did make it to the end). 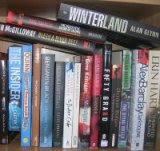 First, the structure is quite chaotic, jumping backwards and forward in history within and between chapters. In fact, I could see no logic to the ordering of the material. Second, the book is almost exclusively focused on the U.S. with the occasional foray into demolition elsewhere, notably Paris and Britain. The kinds of ‘urbicide’ discussed have been widespread across the Western world and elsewhere such as in Eastern Europe, particularly in the period of Soviet control. Third, the book concentrates on demolition in the twentieth century. This is perhaps unsurprising given it was in this time period that it grew to become a well organised, multi-billion dollar industry. That said, people have been building and then knocking things down and clearing the debris away for as long as they’ve been urban dwellers and it would have been useful to delve much more into demolition in the period prior to the twentieth century (which admittedly would require widening the geographical remit significantly beyond the US).